Every paid wrestler / member will again recieve a team t-shirt, however, if any parents or siblings wish to order a t-shirt for themselves, be sure to get your order in early! 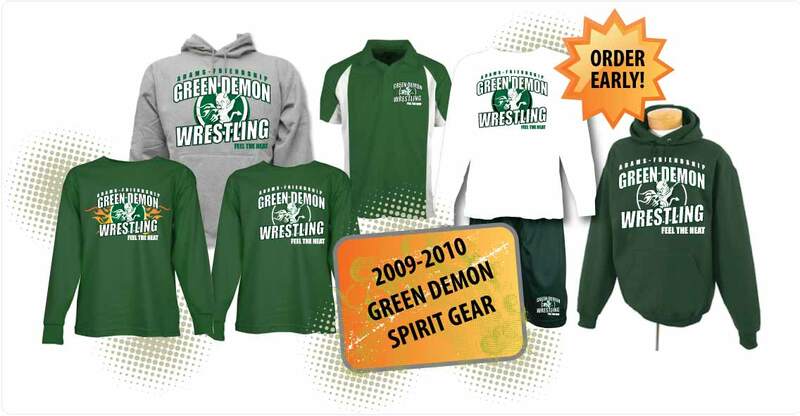 This year, there is a variety of Green Demon Logowear / team gear available for purchase. All of these items are being sold at cost, and with the exception of team singlets of course, all of these items are optional. Watch for flyers and information to be coming out soon with information on how to order, and item cost. We are working to put together options to inlcude sweat suits / warm ups, shorts, beanie caps, gear bags, hooded sweatshirts and more! All items will be available in both youth and adult sizes, and we are also trying to provide a range of costs as well. Only one order will be placed, and we must have a minimum of 12 of any item to place an order. Please see Deb Kniprath for order forms and details, or if you have any questions. ← THE 2009 – 2010 SEASON IS HERE! COME FEEL THE HEAT!